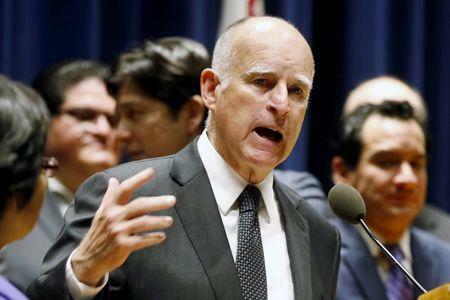 LOS ANGELES (Reuters) - California Governor Jerry Brown signed into law on Friday a bill to require anyone planning to build a homemade firearm to first obtain a serial number for the weapon and submit to a background check, his office said in a statement. The legislation signed by the Democratic governor of the country's most populous state follows his signing earlier this month of a sweeping package of gun control bills. The office of California Assemblyman Jim Cooper, a Democrat who authored the bill, earlier this year said in a statement the legislation would end the production of home-made, untraceable firearms, which have come to be called "ghost guns." The law bans the manufacture and possession of a home-made gun unless the builder first obtains a serial number from the Department of Justice and demonstrates that he or she is not prohibited by law from owning a firearm, such as due to a felony conviction, Cooper's office said. Representatives from the National Rifle Association and the California Rifle & Pistol Association did not immediately return calls to seeking comment. A representative for Cooper did not return an email seeking comment.